I’m in awe of Joe Hill. Few authors today continue to impress me book after book. Perhaps it’s a cynical view, but I generally start each new book expecting disappointment. i’m going to have to rethink that approach. If you have yet to introduce yourself to Hill’s writing, you have no viable excuse. His previous outings, including Horns, Heart Shaped Box, and the short story collection 20th Century Ghosts, have rightly secured him in the company of today’s strongest horror writers. Like his contemporary peers, Hill knows horror isn’t just about monsters – it’s about life, it’s about love; and it’s about characters we, as readers, gravitate towards – flaws and all. It’s an approach he exercises well in his newest presentation, N0S4A2 (work it out, it’ll come to you). A proper summary of this hefty tome’s plot is difficult, admittedly. Hill introduces one of his most likable characters in the form of Vic McQueen, a spunky kid with an odd ability to travel anywhere via and old, dilapidated covered bridge and her bike. That gift – if that’s what it is – seems more like a curse, lands her in the cross-hairs of Charles Manx, a notorious child killer who collects children to take them off to the mystical Christmasland. Manx is anything but a Jolly Old Elf as he travels the countryside along with his Renfield-like henchman, Bing, dispatching parents and killing kids. And once the kids are killed, they become creepy, soulless remnants of their former selves. However, at its heart, N0S4A2 is an examination of dysfunction, mainly that of families. We watch Vic grow from that adventure-seeking tot to a recovering drug and alcohol addict who struggles not just with the demon that Manx is, but also with the personal demons present with addiction; an estranged son who joins her in her quest; and a marriage that seemed plagued with failure from its beginning. It’s here that Hill shines. His depiction of a mother trying to reconnect with her son while also realizing a past she thought was nothing more than a twisted dread is, in fact, reality, is not only believable, but is also fraught with a raw emotion seldom seen in today’s fiction. Don’t assume that means Hill has skimped on the scares in return for sentimental scenes, though. This man knows how to paint mental images that are burned onto your frontal lobe and will bore through your brain like a slow burn. I refuse to get into Hill’s lineage and gene pool, but let’s say readers in the know – which should be just about everyone these days – may find themselves forgetting just whose book they’re devouring. That’s meant as a compliment, not a cop out. Book are made to last, not just in their physical form, but in the mental state of the reader as well. Hill either knows this, or just has the knack for presenting his readers with a universe that fully envelopes them and sticks with them long after that last page is lingered over. 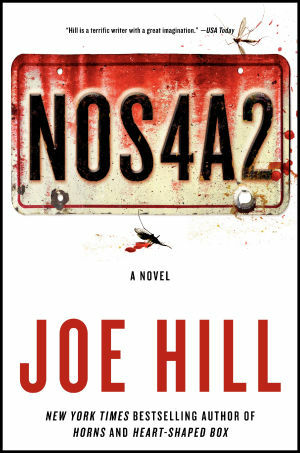 N0S4A2 won’t be leaving your memory any time soon and, let’s hope, Hill certainly won’t be exiting the horror scene in the near future if he continues to travel the path he’s on.